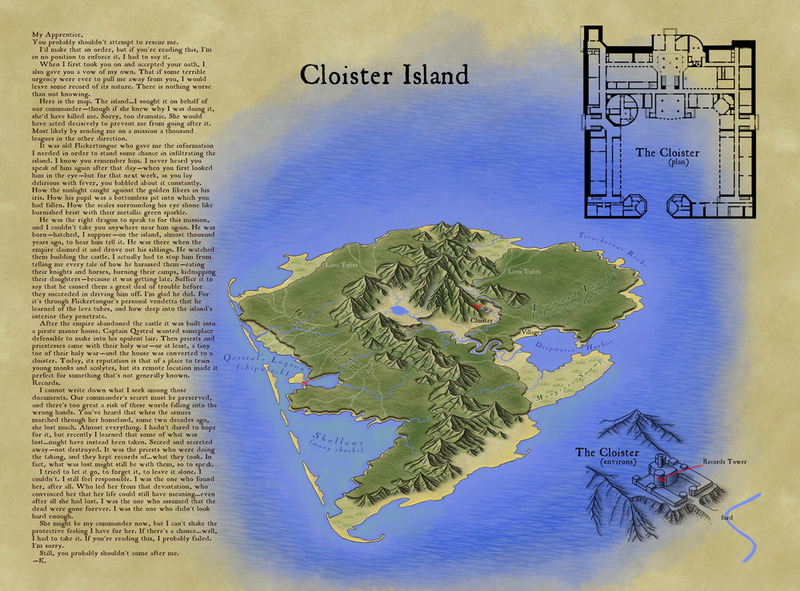 Cloister Island. It probably deserves a cooler name. I think that the last contest I won was junior high school science fair. Not sure. I don't enter a lot of contests. A couple weeks ago I came across an on-line map-making contest sponsored by ProFantasy.com, makers of great cartography software for role-playing games. Make an island, they said, about three miles across. Something like a medieval treasure map. The contest had been open for months, but was closing in just a few days. I took a look at the submissions that had been sent in thus far, decided I had a shot at winning, and threw myself into it. Victory! As judged by Mike Schley (something of a legend in the fantasy cartography world, and someone whose maps I've been admiring for years) my map took the prize. I worked feverishly, right up to the deadline, and actually ran out of time to put everything I wanted into the map. That's why there's no border around it, and no compass rose... But what I did manage to produce followed my vision. I wanted to have some storytelling elements that would blend with the drawing. Some secrets or clues that would only be available to those who looked closely. And an overall aesthetic that was vivid and eye-catching.